The commenter “Konnu” on my last post about the Clowns of Tower Hamlets has pointed us all in the direction of Ross Lydall’s blog on the Evening Standard website. It was Ross who broke the story about Speaker Mizan Chaudhury’s taxi bills. On his blog, he provides the detail of the claims Mizan has made since last September when he felt forced by Mercedes Mayor Lutfur Rahman to take taxis to official events. The amounts are quite mind-boggling and as another commenter, “You couldn’t make it up!”, also noted on the last post, they raise serious questions about who signed them off and why. Clearly, these could not have been ordinary black cabs the Speaker was taking to events such as the “Sultanate of Oman’s National Day reception in west London” on November 18 (cost £128.10), or to a “Citizenship ceremony in Hampton Court” on October 25 (cost £258.80); or to a “Reception for the Ethiopian Ambassador in Redbridge” on October 31 (cost £146.69); or even to the “Speaker of Hackney’s Charity Event in Mare Street” five miles away from the Tower Hamlets Town Hall on September 28 (cost £145.80). Surely not? So what kind of cars cost that? Why was the meter left running? Some of these events suggest there is some kind of cross-borough ceremonial mayoral racket going on with taxpayers picking up the tab. Sorry, but what do the ‘WW’ and the ‘Y’ stand for? The initials of the chauffeur service he used? Images of Lady Penelope and Parker “Yes, M’Lady” spring to mind. Even taking FAB1 from Tracy Island aka Mulberry Place to West Ham would not cost £287.80! And who are Darpan that they have cost us £287.80? Googling ‘Darpan’ revealed nothing. Nomouse (lol!) ……….. you aint no cat either, however a big meow! from LR to you. Let’s be clear here. Mizan had nothing to do with the taxi bookings. He would of accepted invitations to attend events as all other civic mayors do, but the bookings would been done by the Council. We all know of the instruction that was given by Lutfur for Mizan to take cabs and he had no choice. We all also know that Lutfur terminated the use of the civic leased car, whilst ordering himself a Mercedes. We all also know that Lutfur’s reasoning was to save costs and he holds the purse. The question really now is if there was no budget for the civic car who has been paying for the taxi fares and where did all these funds come from? Under the current governance arrangements Lutfur would have to authorise it and he did from the day he instructed Mizan to use taxis. We also know of Lutfur statement in the council chamber ‘’the buck stops with me’’. Doh! Civic mayor’s get invited to so many events within and out of the borough – this is normal and it is part of their job. This system has been running over 100 years. And Tower Hamlets is not the only borough with 2 mayors. The other boroughs don’t have the same problem though, and that is because their elected mayors do not interfere with the civic office, like our one. Do an FOI that will reveal which events Mizan attended and the ones he really didn’t, also who was more concerned about the costs being incurred by the council – Mizan or Lutfur? – you will be surprised with the truth. Just a suggestion for you when you change your username again/next time ”nohouse” – it will suit you and that is the reality of LR cheapies! Mizan has everything to do with the taxi bookings. The taxis are for him. He decided to take a taxi and ask it to wait while he conducted his business and charge the rate payers of Tower Hamlets for the pleasure. Rate payers who are currently suffering the fallout of the worst recession since the Great Depression and, looking at the figures, set to get even worse. He had the option of a Prius (and the Council would probably have given him a chauffeur with it). I could probably think up numerous questions, all along those lines. They’re eminently more sensible questions, don’t you think? When you speak to Mizan, let him know that he’s dug himself a hole. Stop digging. Apologise, take the Prius, and get on with doing what you’re meant to be doing – i.e. don’t take the Prius to B’ham. Actually, Robin Wales has taken on both roles in Newham. Maybe we should do that in Tower Hamlets? One less SRA to pay, one less car, one less idiot to give the place a bad name. Mr Bish Bosh, please dont take us for fools, the evidence is there for us all to see, Mizan has been lavishing on our money end of> do the decent thing and give the money back,and get on the prius, show us that you care. This just shows mizans true colours, he doesnt care for teh community just his own ego and how he can become leader. Labour Group really need to discipline this boy and whack him in line, hopefully that will stopo the arrogance. Bosh, we know lutfurs true colours aswell, But blaming him for your dodgy ways is pathetic. These figures are entirely spurious and there has to be some sort of fiddle going on somewhere. (Yeah, I know – this is stating the obvious, you might think). I have frequently had to take black cabs from central London (normally SW1) to Bow and I can tell you that £20 will cover the journey one-way at night, £30-£40 in the daytime. I’ve also had to take black cabs very occasionally from east to west London (similar areas to where the Speaker was going) and for that journey one-way you’re looking at £60. And that is in a black cab – as Konnu (I think) pointed out, the council should have rosters of approved minicab services so the fees should be a lot less. Is it possible that these prices are because the cabs were kept waiting while the events took place and then drove back? Well I have no idea about arrangements for most of the events. But three in particular stand out as either being unlikely or impossible to wait at. 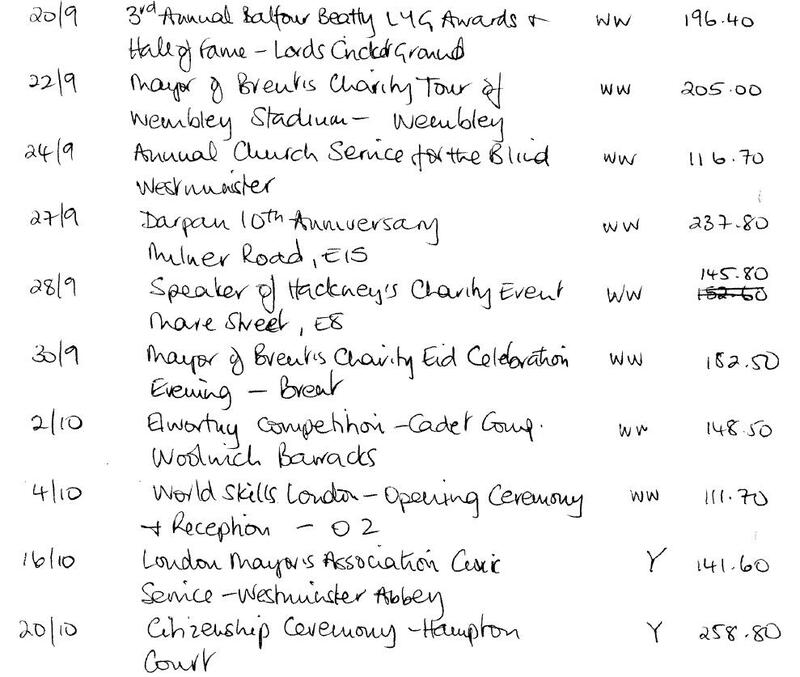 12th November: a whopping £129.80 to get to Mansion House for the Lord Mayor’s Parade (!!!!!) (PS Here’s a clue Mizan – it’s £2 on the tube even now the prices have gone up and it’s only a few stops. Or if you’re in Aldgate/Spitalfields you could walk it!) I cannot see how a taxi could wait for the Lord Mayor’s Parade to finish – I have no idea where they would go. More importantly, 17th November and 14th December saw two events at the House of Commons – one to celebrate/push Tower Hamlets City Status bid and one hosted by Rushnara to celebrate the 40th anniversary of the independence of Bangladesh. I can categorically state that it would be impossible for any minicab (or in fact even a mayoral car) to hang around at the House of Commons while an event is on. Security will not even let such a vehicle through the gates, let alone allow one to park there (and there’s no room in the car park anyway). These two trips cost, respectively, £146.21 and £116.60. What was that money going on, given what I’ve said already? Also, I would expect many councillors and officers from Tower Hamlets Council to attend a House of Commons reception to push the city status. It is a business reception and is in the interests of as many of them as possible to be there to talk to MPs. Why were they not sharing vehicles? I would also expect (given the large proportion of Bangladeshi councillors) that Mizan would not be the only one attending the reception to celebrate the anniversary of independence. (Although I may be proved wrong on this one – it’s not so much a business case for Tower Hamlets as it is a personal background choice for individuals). But again – why would there not be shared transport. I just called Addison Lee. A trip from Mulberry Place to Mansion House on a Saturday morning (so we can compare with the Lord Mayor’s Show outing) costs £28.40 for an E-class Mercedes chauffeur driven car – that’s their premium service. The waiting times are £23 per hour. So, if that’s the car which was booked then a return journey would have cost £56.80. Mizan’s bill was £129.80. That implies at least three hours’ waiting because the council is sure to have an account with Addison Lee and therefore be entitled to a discount. I suspect that the only way these amounts make sense is if luxury cabs have been hired. Again, whoever has been ultimately signing these amounts off needs questioning. It sure doesn’t add up. And why ask them to wait, why not book a return pick-up in three hours time? Do we really want our elected representatives to attend all these events on our behalf? Who decides what they should attend? Bosh, doh, you didn’t explain to this thicko why Mizan is accepting and attending certain events? He needs to justify those acceptances and his attendances when he is charging us hundreds every couple of days for his presence at them. You do the FOI Bosh into Mizan’s choices, if you are so sure that his attendances of a tour of Wembley that cost us £205 and a trip to E15 for the10th Anniversary of something called Darpan(?) are justifiable. Oh, on Mizan’s other money-pit, Rich Mix, I don’t know why the pleadings in the ELA to keep it afloat when on their website Rich Mix management lists one of their Achievements for 2010-2011 as “secured a legal agreement with London Borough of Tower Hamlets for ongoing support”. Seems LR loves Rich Mix. Maybe LR loves MC? on January 28, 2012 at 1:19 am You couldn't make it up! If – as Bosh says – Mizan had nothing to do with the taxi bookings then he wouldn’t need reimbursing for them would he? A taxi requisitioned via a corporate order should normally be invoiced to whoever ordered it – as part of the normal accounting process. So what’s this claim for expenses all about then? Why is a claim even being submitted? Also – Mayors get asked to all sorts of activities and celebrations – but that doesn’t mean they have to go. It seems to me all these bookings should in future have a clearly defined benefit for the population of Tower Hamlets identified before an invitation is accepted. That’s a benefit as in “this event is of a higher priority than any of the services which have been cut in the last financial year”. Sometimes things – like the habits of MPs when claiming expenses – carry on until somebody turns the full glare of publicity on them and starts to ask very pointed questions about WHY something is seen as a legitimate expense when it is funded by taxpayers money. We can all recall how that was then followed by a very large number of MPs then having to repay expenses they had claimed. Ted – how about asking some of the other boroughs which held events how many of the Mayors from other boroughs attended? on January 28, 2012 at 2:32 am You couldn't make it up! Hmmm – maybe I’ve misread this and this incident does not involve a claim of expenses? Where did these figures come from? They look like they’re an annotated record of sums paid – but is this via an expenses claim or a list compiled from inspecting several invoices? Ted – can you get Ross to confirm the nature of the note even if he protects his source? I looked through the records on the page on the Council’s website which records all payments to Suppliers over £500 (which is now required since the MPs expenses scandal) and found these Addison Lee invoices for November which are directly attributable to the Civic Mayor/Chair of Council. There are no other such invoices in the rest of the financial year – so maybe the issue of how much the taxis are costing has only just come to light? Seems to be there’s maybe been some tactical leaking going on here……. 1) Which Council Officer has been ordering and authorising expenditure on these taxis without paying any attention to how much they’re costing each month? 2) Why are Addison Lee not invoicing on a monthly basis for all journeys by the Civic Mayor? 2) Why are events being attended that have very little connection with the Borough? In times of economic constraints all ceremonial events should be strictly limited to those where there is a direct and real benefit to ALL residents of the borough. 3) How come there are no invoices for a leased car for the Executive Mayor being logged each month under the Corporate & Democratic Core budget? The dodgy goings on in this borough are beyond a joke now. 4. All decisions to undermine the civic office were made by the elected mayor -funding his personal fight with Mizan with taxpayers money – how irresponsible of him! 5. Mizan is right in saying he has been sticthed up by Lutfur and knowing how Mizan operates, he should have all the evidence to prove that. 2. The Mayor of London (an elected Mayor not a civic mayor) uses a bike, and other elected mayors use public transport, their own cars or occasionally a taxi – so there is no argument or justification for the elected mayor of Tower Hamlets to have a Mercedes or any type of car – yes, that is payed by tax payers of Tower Hamlets too. Maybe we should try and find out how much the Mercedes and his chauffeur actually costs Tower Hamlets tax payers? 5. 4 out of 32 London Boroughs have elected mayors, as well as civic mayors (speaker/chair of council) – reason being the elected mayors are political and cannot be the First Citizen or civic representatives of their boroughs. Also 3 out of the 4 elected mayors do not interfere with the civic office like the one from Tower Hamlets. 6. Civic mayors attend each others charity fundraisers to support raising funds for each others charities – that is normal and a tradition. 8. 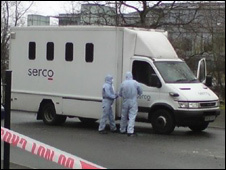 We all know that Lutfur terminated the use of the civic leased car, whilst ordering himself a Mercedes. 9. Lufur is the only elected Mayor in the whole of London that has a Mercedes and a chauffeur being paid by the taxpayers. 11. Most people commenting on this blog and especially this piece are Lutfur supporters and most likely being paid to defend the elected mayor of his wrong doings – just by having English or funny usernames does not hide these facts. 12. Under the current governance arrangements Lutfur would have to authorise the budget for Speaker’s taxis, and he also had the powers to put a stop it. Why did he let it continue? 13. We all also know that Lutfur’s reasoning to remove the civic car was to save costs, so where did all the extra money come from to fund Mizan’s taxi fares?- if there was no budget who has been paying for them and why? – it’s quite clear and an obvious plot that was done against Mizan by Lutfur and his paid advisers.